One of the most revered, and controversial, relics of the Roman Catholic Church has finally been shown to be an unequivocal fake. 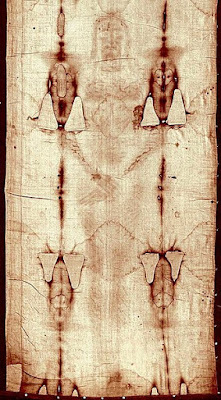 The Shroud of Turin has engendered more speculation, criticism, and questioning than any other relic, and that includes things like the skull of Mary Magdalene. 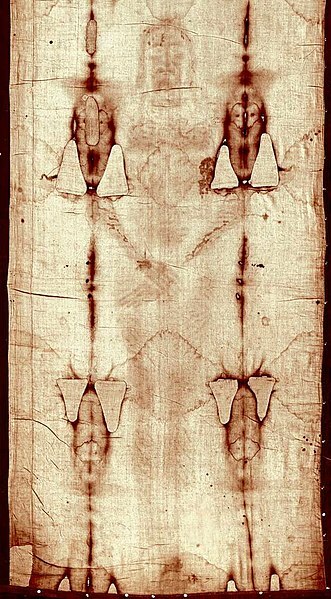 The Shroud is a 4.4 meter long piece of linen cloth with the impression -- it looks very much like a photographic negative -- of a naked man showing the traditional injuries suffered by Jesus Christ during the crucifixion. It's generated incredible devotion -- not least from an Italian firefighter who dashed into the burning Guarini Chapel in 1997 and risked his life to save it. While church leaders have not come right out and said it's real, they've made statements that amount to the same thing. In 1958, Pope Pius XII approved reverence of it as "the holy face of Jesus." More recently, Pope John Paul II called it "a mirror of the Gospel." The whole thing began to unravel -- literally -- about thirty years ago, when scientists were finally allowed to do radiocarbon analysis on a tiny snippet of the linen cloth, and dated it to between 1260 and 1390 C.E. with 95% confidence. Oh, but no, the True Believers said; it had more than once been through a fire, and soot would change the C-12 to C-14 ratio and throw off the dating. Plus, the yellow-brown dye on the cloth was shown through chemical analysis to be older, and the cloth snippet was from a more recent repair job, anyhow. So back and forth it went, with the skeptics saying the preponderance of evidence supported its being a hoax, and the devout saying it was the real deal. But now two Italian scientists, Matteo Borrini and Luigi Garlaschelli, have presented a paper at the 66th Annual Scientific Meeting of the American Academy of Forensic Sciences that takes an entirely different approach. Long-time readers of Skeptophilia may recognize Garlaschelli's name. He was the one who back in 2016 did a simple little demonstration of how the miraculous "weeping saints" -- statues of saints that appear to cry real tears -- can be faked. So he's not a man who would be easy to fool. And what Borrini and Garlaschelli did was to look at the Shroud through the lens of blood-pattern analysis. Anyone who's fond of the series CSI probably knows that a trained forensic scientist can tell a lot from blood spatter, and this is no different. The story goes that Jesus's body was wrapped in the cloth after he died, staining it with blood from his various wounds, and that's what created the image. An investigation into the arm and body position required to obtain the blood pattern visible in the image of the Shroud of Turin was performed using a living volunteer. The two short rivulets on the back of the left hand of the Shroud are only consistent with a standing subject with arms at a ca 45° angle. This angle is different from that necessary for the forearm stains, which require nearly vertical arms for a standing subject. The BPA of blood visible on the frontal side of the chest (the lance wound) shows that the Shroud represents the bleeding in a realistic manner for a standing position while the stains at the back—of a supposed postmortem bleeding from the same wound for a supine corpse—are totally unrealistic. Hey, all for the good of scientific research, right? So this should close the book on the Shroud of Turin, but of course it won't. The Shroud apologists have argued against every other piece of evidence, so I have no doubt that they'll argue against this one, too, especially since Garlaschelli is involved. The Italian Catholic powers-that-be hate Garlaschelli for his role in the Weeping Mary Caper. But anyhow, it's good enough for me, and should be good enough for anyone else who is a self-styled skeptic. But it still leaves me wondering how it was done, because whatever else you can say about the Shroud, it's really realistic. Take a look at many 14th century paintings of people -- they're stylized, cartoonish, with zero attention to perspective. This? It's painfully accurate, down to the last detail. So say what you will, whoever created this thing had some serious talent. It's a shame he put it to use creating a fake that has duped people for over six hundred years.